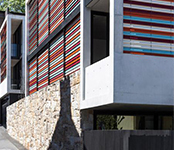 Brougham Place is a new home, office and apartment in the dense inner-city location of Potts Point, Sydney. The former single-mass dwelling was replaced with two buildings, thereby creating a courtyard in the middle. 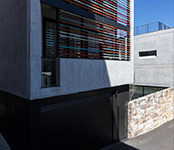 It uses the height of the rear three-storey apartment and garage to shield the courtyard from overlooking from the taller neighbouring apartment buildings. 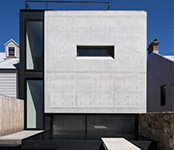 Architecturally, the building presents as two concrete boxes sitting over a sandstone wall. 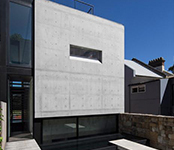 This sandstone was salvaged from the site and rough-cut by stonemasons to create a beautifully textured element that wraps around the front façade and side lane of the site. 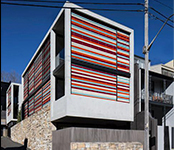 Above the plinth, the concrete boxes feature large openings infilled with an array of multi-coloured External Venetian Blinds, the palette of which draws upon the heritage colours of the area. The larger front dwelling contains the owners’ home and office. 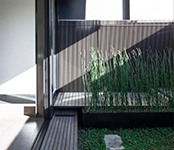 For the workspace on the ground floor, the life and noise of the street is filtered through a finely-detailed steel screen and green courtyard. 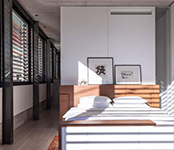 A small bedroom with a fold-down bed concealed within joinery at the back of the office space can be partitioned off via a pivoting pink steel door. 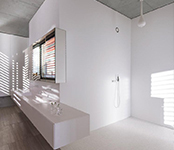 White joinery conceals coloured interiors, matching those of the external louvres. The living spaces feature travertine stone floors, off-form concrete walls and ceilings and white joinery, such as the custom designed coffee table with hinged lid that conceals a hidden television. Timber detailing including a cantilevered breakfast bench were selected to marry with our client’s beautiful antique furniture. And, creating striking graphic patterns, Caravaggio pendant lights can be moved to any position by using large magnets that hold them to the metal reinforcement within the concrete ceiling. Detailed joinery pieces are designed to seamlessly integrate the operation of the house: such as slide-out reading lamps, touchscreen drawers and a pop-up television within the master bed suite. 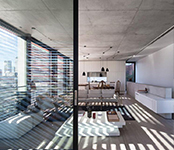 The rooms on this level are formed from a series of floating planes within the concrete and glass shell that maximises its northern exposure and the extraordinary views of Sydney city and harbour. The rear building houses a garage with a single bedroom two-story apartment above. Clever planning sees stairs winding around the perimeter while the living spaces open onto north-facing balconies. 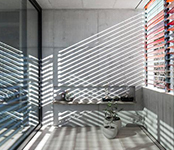 The louvered façade controls light and views, and as in the main house reflects extraordinary light and colour into the rooms. 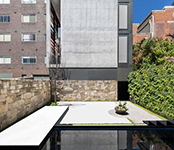 The central courtyard extends the composition of the internal planning to the outside, with planes of timber and concrete hovering over a reflective black granite-slab plunge pool. It’s a simple place of calm and introspection nestled between the two dwellings. Through careful consideration of volume, scale and openings in response to the surrounding built form, the interplay of shelter and openness, private internal and shared outdoor space, the site has been transformed to provide contemporary inner-urban living while maintaining a distinct link to the history of the area.